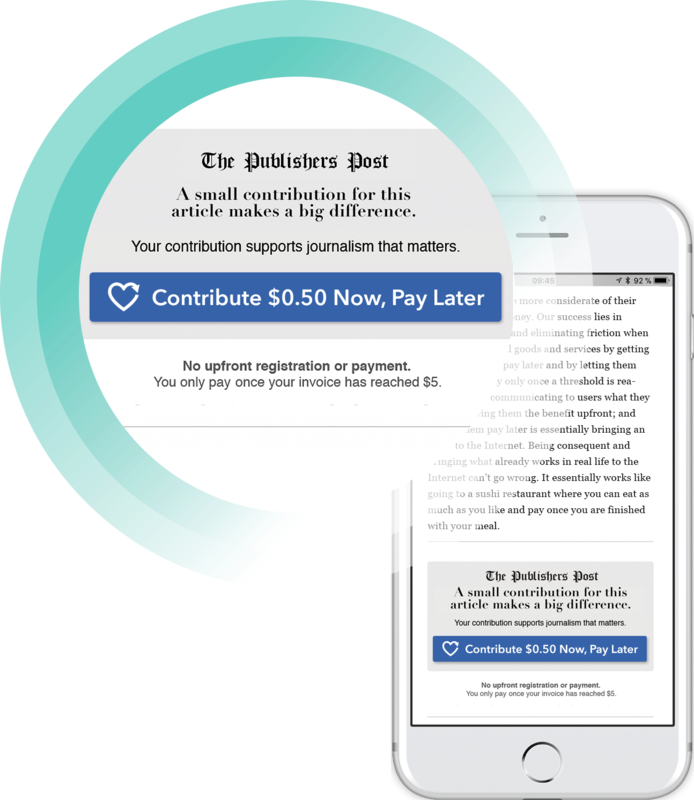 The LaterPay button enables your readers to make monetary contributions with a single click. The button can be combined with an existing advertising or subscription revenue model. In just a couple minutes, you can create a custom button that can be placed on your website, in newsletters and within social media posts. Using the LaterPay button, you can choose to ask for registration and payment either immediately or later - after reader's tab has reached $5. Tip: readers are 4X more likely to make a payment if allowed to pay later! Users commit to a contribution without upfront registration or payment. Once a user’s tab adds up to $5 or more, the user is asked to pay. This results in high acceptance and conversion rates. You define the price, message and design of your button. Easily implement it on articles, videos, newsletters, value added services and social media channels. Risk-free, commitment free, no setup or running costs, no licensing fees – commission is charged only on actual revenue generated. User validation and tracking, purchase aggregation, invoicing, tax calculation, and data sharing is handled by LaterPay. Ability to let users register and pay now or pay later for better conversion. Get the LaterPay button now!